Are you 17 years-old or do you remember when you were? What would you do if your genetics gave you special powers? If suddenly your mother was taken away by a corrupt governmental agency? If your family expects you to join “the revolution?” And all you want to do is live a normal life and be with the ones you love. Dealing with being a teenager is hard enough. 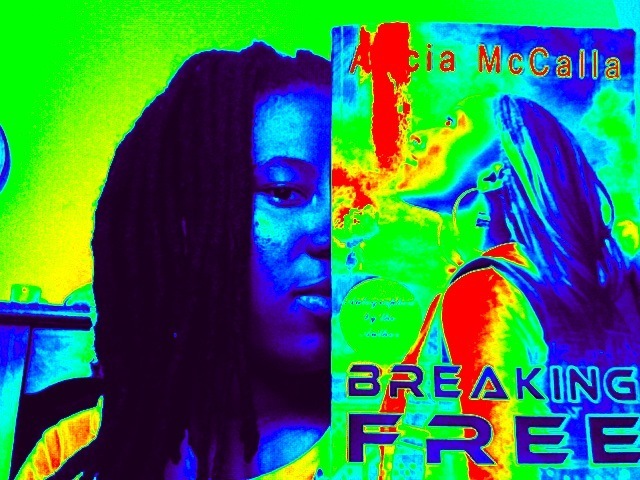 Well, that is the story of the main character, XJ Patterson, in Alicia McCalla’s book Breaking Free. The first book in the McCalla’s Genetic Revolution series, the story follows the struggles of “Genetically Enhanced Persons,” or “GEPs,” specifically XJ, who is on a mission to rescue her mother and member of the Revolution, Dorothy, from CAGE, the “Coalition to Assimilate Genetically Enhanced Persons.” Yet on the way, she has to battle her feelings for Brandon, the son of a TV executive, and her obsessive step-sister, Heather, who has a split personality and her eyes set on Brandon. Breaking Free works in its incorporation of historical and current social issues into an easy-to-read book. The language is simple except for the obvious science fiction jargon and teach paragraph is only a couple of sentences long. The only drawback is that some of the wording and descriptions are a bit awkward, especially the romantic excerpts between XJ and Brandon. For example, the one of Brandon getting “excited;” it is hard to take “his manhood rising” seriously. Yet since it is a book for young adults and teens, it is understandable if it cannot be too explicit. However, the most compelling aspect is the story itself and McCalla’s transformation of social themes, like race, revolution, interracial relationships, government and media corruption, and the disadvantages to assimilation and integration into a sci-fi realm. Although it is from the perspective of teenagers, for those who know the histories and complexities of this country, they will recognize those parts of the book. CAGE is similar to organizations and institutions in the late 19th century and 20th century that were known for attempting to assimilate different ethnic groups into American society. Power reducing chips and monitoring technologies are like the stripping away of cultural identities through assimilation and the constant surveillance of people of color. Even the phrase “compatible mate-designation types” hint at conflicts of race, relationships as well as sexuality in regards to Heather’s character. Personally, the one aspect of the book that has been helpful is XJ’s putting up of mental iron walls to fend off enemies who are trying to overpower her mind, such as the social worker Ms. Hughes. It has actually worked for me in dealing with any difficult people or negative matters in my life. Now if only I could have her telekinetic powers. Or Brandon and XJ’s cousin Amber’s technopathic abilities. I would only use it for good, of course. The sequel to the book, Double Identity will be released in February 2013, so keep a look out for that one as well. NextBehind the Mask: Is Willow Smith Too Young?